Pope Francis' Apostolic Exhortation, Amoris Laetitia has received some negative press. However, when examined in light of Church teachings, it is clear, it holds nothing against the Catholic Faith. Cardinal Müller noted that Amoris laetitia, is in the line of holy Scripture, apostolic Tradition and the decisions of the papal and episcopal magisterium. Amoris Laetitia does not ask the faithful to believe anything that is against the dogma. The indissolubility of marriage is very clear. It is also important to note that neither Amoris laetitia nor the Buenos Aires Guidelines authorize any changes to Catholic canon law. The canonical rules for the worthy reception of Holy Communion articulated in canons 915 and 916 of the 1983 Code remain fully in force." A number of people contributed to the production of the resource, including Bishops: His Eminence Gérald Cyprien Cardinal Lacroix, Archbishop of Québec and Primate of Canada, His Eminence Thomas Cardinal Collins, Archbishop of Toronto, the Most Reverend Christian Lépine, Archbishop of Montreal, the Most Reverend Terrence Prendergast, S.J., Archbishop of Ottawa, the Most Reverend Richard Smith, Archbishop of Edmonton, the Most Reverend Paul-André Durocher, Archbishop of Gatineau, and the Most Reverend Noël Simard, Bishop of Valleyfield. Dr. Michel MacDonald, Director of COLF, and Dr. Moira McQueen, Executive Director of the Canadian Catholic Bioethics Institute, were also resource persons for the project. I take them seriously ... but I also recall their support of the Winnipeg Declaration. 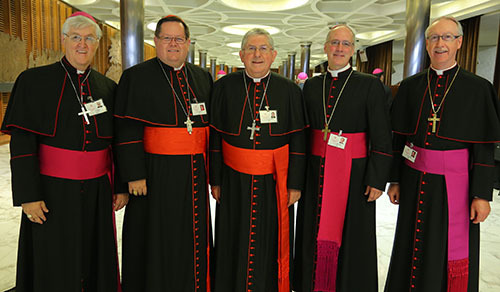 Not one of these bishops was even around at the time of the Winnipeg Declaration! They are all JPII bishops. To question their orthodoxy with such a spurious and inaccurate allegation as you do above does neither the Church nor you any favour.